Since the clocks have changed I seem to have been able to be a bit more proactive and rather than pondering on what to start or spend time looking at all the things I could be doing and being inspired I've actually been doing. Plans are coming together for the garden. 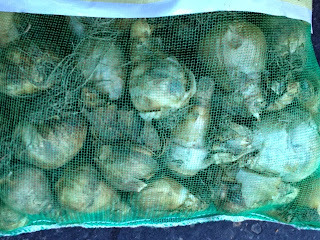 I've bought some bulbs, a simple mix of daffodils and tulips, but they're not yet planted. That was to be today's job but, it was raining during nap times and I'm feeling a bit of a fair weather gardener at the mo as it is noticeably chillier this week. It will be done as we're forecast a sunny spell later in the week. I've also been browsing the seed catalogues. Its cheering me to think about how our garden will look next spring. The last couple of years the garden has taken a back seat and certainly this year with a newborn. Last year was very reliant on perennials and my Dad bringing me some cheery geraniums, petunias and begonias. I'm in awe of the people who manage nighttime feeds and a stunning garden! BigR has asked for sunflowers so I'm sure we can oblige her request. She'll have to watch where she kicks her ball for them to stay standing! She has a killer volley! 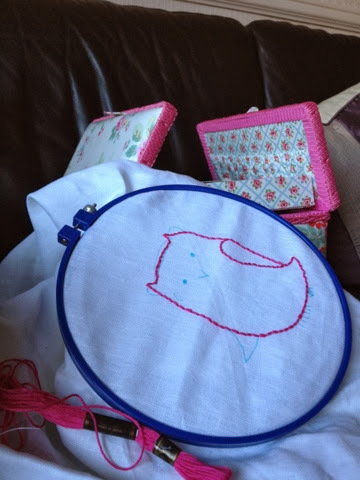 I've managed to do a little embroidery; the owls for LittleR. I used this as my inspiration. It was a pattern I bought about 18 months ago when my friend had her little boy. I stitched this for him, adding his name and date of birth too. Although the owl stitching is complete (I think - I always have a little wobble maybe I should add a little bit here or there), it is not quite finished yet. It needs pressing and mounting, and I should be able to do this this week as I have bought the frame (thank you Ikea). I've also sought knitting inspiration. 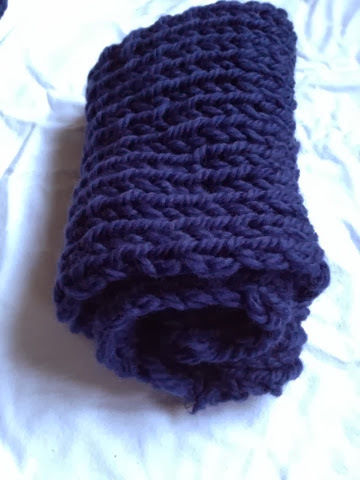 I wanted to try out an idea for some Christmas presents. I'm not making all the presents this year but i know some people would appreciate a homemade gift. I saw this and then this and then got over excited and had a go. It didn't turn out the same....I think I 'ribbed' rather than 'moss stitched'...it's not bad for a first attempt. I started a second straight away, in the correct stitch this time, and it's looking how it should now! 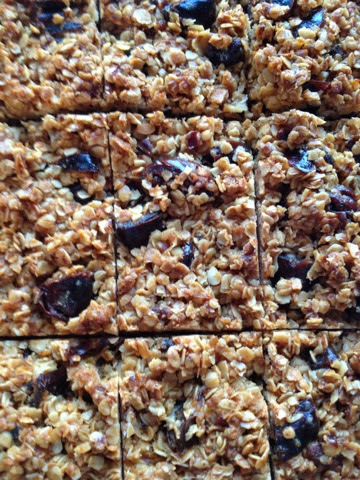 I've also been making some eating treats too. I love lemon desserts, cakes, tarts - anything lemon. So I used my trusty Nigella lemon cake recipe. The ABO does not share my love of lemon so he received some date and ginger slices the recipe taken Peyton and Byrne British Baking. The first time I made these I cooked them for the stated time, but they were a bit crumbly. So, this time I left them to cook for a further 10 minutes and they were much better. 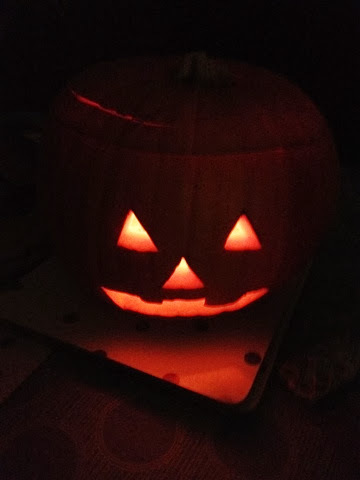 Although it's bonfire night tonight, I always think, better late than never, I did carve a pumpkin for BigR last week. Well I started and The ABO wasn't that impressed with my knife skills so helped me out. She was very impressed with the two tealights I put inside it. I used to do this for my brother when we were children (there was 6 years between us so it isn't as weird as it sounds!) It's reaching the end of it's life now so I should really remove it to the bin. Does that count as a creative activity? There wasn't any bonfire activity this year. The ABO is working and it's a bit cold for LittleR. The local display appears to still be going on....way past bedtime BigR's bedtime. It's good to warm and cosy at home catching up with things. Hello - we didn't make it to a bonfire either (for similar reasons). I'm trying to make Christmas gifts this year but have decided to buy things for the men as they're always harder to find things for... can't see scented candles or bath salts going down too well. I really hope the handmade candles work this time! The Nigella recipe is one of my favourites. What a busy week! I completely forgot about spring bulbs, I wonder if it is too late?